Chocolate is my salvation, saving me from the sins of motherhood — irritation, boredom and sarcasm. I can gauge the day by the amount of chocolate I eat. A good day is a small, exquisite piece of chocolate with a cup of tea. 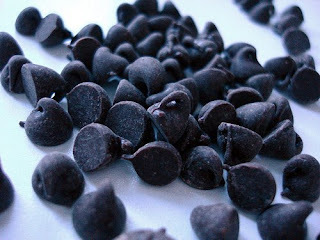 A bad day is fistfuls of chocolate chips shoved into my mouth. When life is motoring along, maybe I hit a few bumps, but I can keep afloat, keep laughing, then it’s definitely a chocolate chip cookie day. The chocolate chip cookie has defined my life since I was a little girl. My first memory of this perfect treat is of the softball-sized cookies, loaded with tiny chips that my grandma would offer me from Stickney’s Hickory House in Santa Clara, California where she was the bakery manager. The cookie was half the size of my face, and I would nibble it slowly, trying to eat just one chip at a time. At home, my mom always had a bag of chocolate chips on hand, and so when any of the kids hankered for a warm cookie, it was just a mixing bowl away. There were two rules when it came to chocolate chip cookies. First, we had to use just half a bag of chips for a full batch of cookies. (A money-saving trick, my mother admitted later.) Secondly, and most importantly, was ownership of the cookies. The dozens of cookies cooling on brown paper bags in the kitchen belonged to the baker, and how the smaller siblings would delight in their power over the older ones! Being baker was like playing God, people prayed for your cookies, promised things for one, so you doled or denied on whim. One couldn’t blame the baker. In a family of eight, a batch of cookies was as ephemeral as the sweet smell that emanated from the oven — as soon as the baking stopped, the cookies were gone. In an effort to prevent this, the baker counted and stacked her sweets, but a slow walk around the cooling cookies, a nonchalant leaning against the table, and the surreptitious hand depleted her stash quickly. Then the baker would demand a showing of hands, and sometimes even a whiff of the accused’s breath, in search of telltale chocolate and a determination of guilt or innocence. So I was surprised on a recent raid of my mom’s cupboard to find bags of old chocolate chips, stale chips, white and chalky tasting. These bags must have been years old. Can there be a time in life when cookies aren’t required, when chocolate isn’t needed to save yourself? I can’t believe that. A cupboard without chocolate chips demands an emergency trip to the grocery store. I’m talking necessity, because a week without a cookie is a sad, sad thing. My tried-and-true recipe is baked into my brain, and comes from Nothing To It’s kitchen coach Jennifer Bushman. Throw it all together and within minutes, you’ve got a hot cookie in hand. Cream: 2 cubes of butter, 3/4 cup brown sugar, 3/4 cup white sugar. Add 2 eggs, 2 teaspoons of vanilla, and cream some more. Mix in: 3 cups flour — white, wheat or whole wheat pastry, depending on whether you want to offset your guilt with high fiber — 1 teaspoon salt, 1 teaspoon baking soda. When combined add: 2 cups chocolate chips. Bake at 375 for 10 minutes or until golden brown.